I am a devout carnivore. Punto. I can not imagine being 100% vegetarian for more than ... 1 day. But I can not imagine a life eating pure meats accompanied by rice or potatoes like many people do. You have to be balanced and eat healthy recipes. That's why I like to make salads, in fact, some well-carnivorous and fatty dishes are better accompanied by foods belonging to the vegetable kingdom. This salad that I made the other day is perfect to accompany any carnivorous savage you get crave In fact, the more fat your main course has, the better this companion will work. It's a healthy salad . 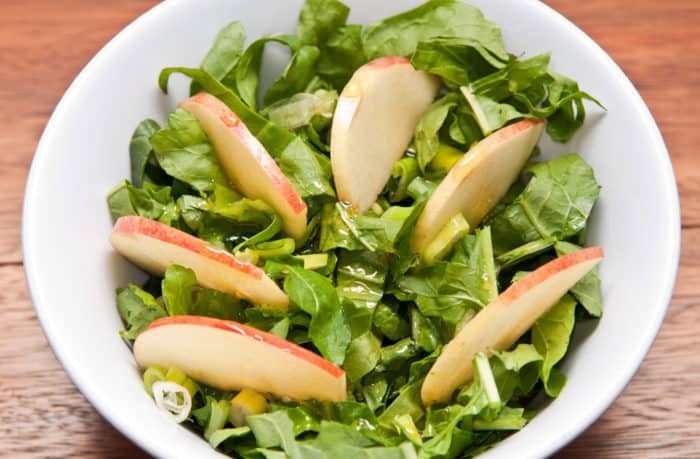 Lemon vinaigrette: Mix lemon juice with a touch of sugar and balsamic vinegar of your choice. If you get to do it, take a picture and try to make the apple segments are better aligned than me.